Joining state historical markers for Froebel School and the Stewart Settlement House, another Indiana State Historical Marker was unveiled Saturday in Gary’s midtown section. 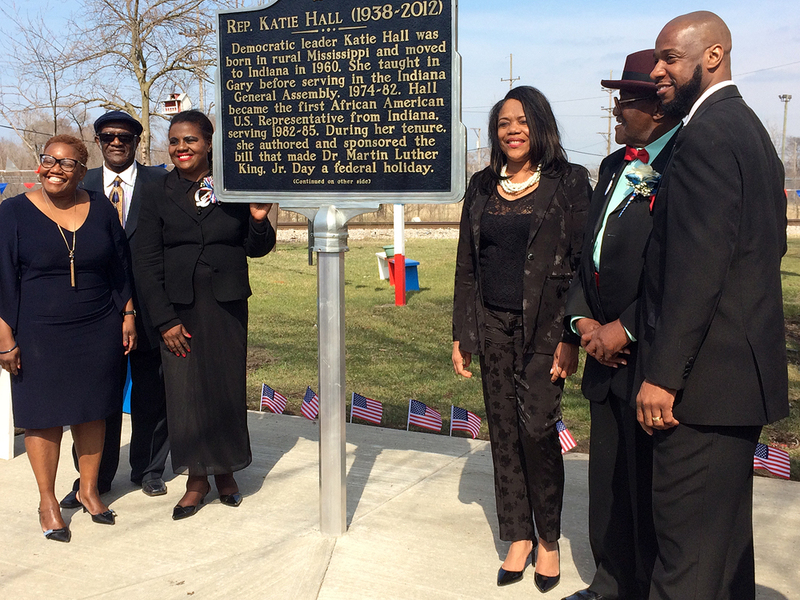 The U.S. Representative Katie Hall and Passage of the Dr. MLK, Jr. National Holiday Law marker is a memorial to Hall and her work to pass the 1983 bill that created the national Dr. Martin Luther King, Jr. holiday. During her only term in the U.S. Congress, Rep. Hall was able to get the legislation passed. Michigan’s Rep. John Conyers first introduced a King Holiday bill soon after Dr. King’s assassination in 1968. Hall revised the legislation and President Ronald Reagan signed it in November 1983. Hall was Indiana’s first black member to the U.S. Congress. Sanders never met Hall, but many who spoke at the luncheon and unveiling of the marker knew her well. The marker sits in the little triangle park at the corner of Madison Street and 19th Avenue, a few doors from Hall’s home. Atty. John Henry Hall, widower of Katie Hall, said the park was a gift to the community from the Means Manor developers. Powers & Sons donated and constructed the concrete pad that holds the marker.